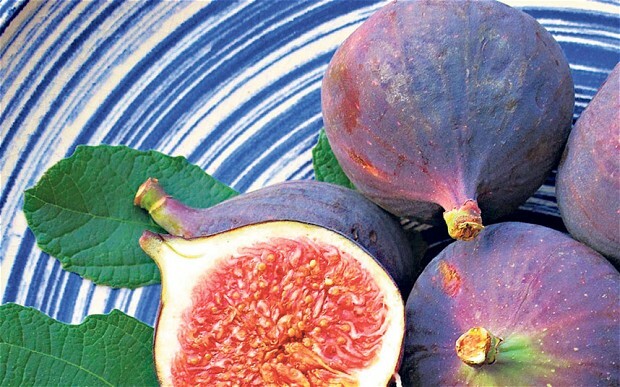 Back to Basics – should include good service. Thursday evening and Back to Basics http://www.pizzeriabacktobasics.nl/ were so busy that they had back-to-back bookings. We were seated in between the toilet and the kitchen, after waiting for our table to be cleared of guests and then having a quartet of young, ill-mannered women make a break for the now-empty table, leaving behind the least desirable table in the restaurant, which we were then seated at. Not a good start, but someone has to get the dud table. Okay moving on. The restaurant interior is cozy and relaxed. The wood-fire pizza oven sits in the middle of the restaurant, oozing the lovely smell of pizza cooking. Staff were initially friendly, then inattentive and careful to avoid all eye contact with guests. Naturally this resulted in delays in ordering, delays in individual meals reaching shared tables; hassle in ordering drinks; and by the end of the evening, an total lack of enthusiasm for dessert. 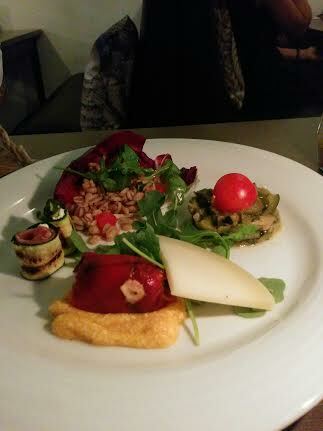 Vegetarian Antipasto (€9): a beautiful display of individually crafted and delicious pieces. The stuffed pepper on a bed of polenta was very good. 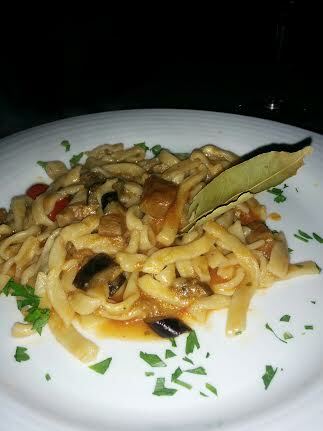 Tagatielle with Mushrooms and Eggplant: the homemade pasta seemed overcooked, which gave the dish a sloppy feel – although the mushrooms were flavourful. 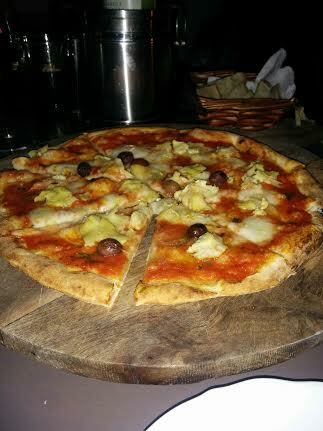 Both pizzas were acceptable – uncomplicated, with light sprinkling of toppings. We both felt that more pizza sauce was needed. We chose an easy-drinking Pinot Grigio (€21) to accompany the meal. Overall: The service was a problem that might be solved by adding more experienced wait staff. The meal was fine, although not worthy of a return visit. Since my last visit to Wijn & Co http://www.wijnenko.nl/, this wine bar + restaurant has moved to the Turfmarkt and won the 2015 Wine Bar of the Year as voted by Grootspraak. Needless to say they have an impressive wine menu and on the night of our visit sommelier, Cathy, was moving between tables discussing the specifics of the selected wines. Our choice of restaurants for the evening was based on an Iens restaurant arrangement for two three course meals for the price of one. In Dutch, “twee halen een betalen”. 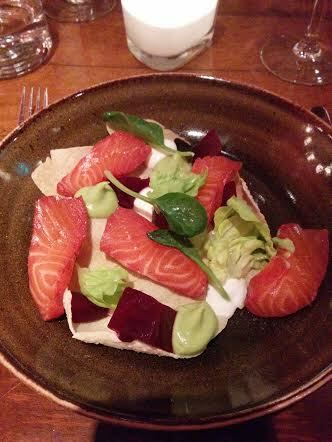 Tandoori Salmon pieces served on a pappadum with leafy salad and beetroot. Beautifully presented plate. The tandoori flavour was delicate and a little overpowered by the taste of mayonnaise from the accompanying sauces. 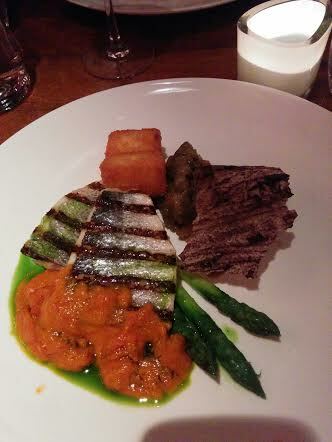 Sea bass fillets served with grilled asparagus, cheese croquettes, paprika salsa and grilled eggplant. Perfectly cooked fish, deliciously partnered by the vegetables and salsa. Duck: perfectly cooked duck fillet slightly let down by an absence of accompaniments. Cheese Plate consisting of three tiny slices of cheeses differing in type and taste intensity, served with fruit bread and crackers. Aesthetically pleasing but too little cheese to appreciate the individual flavours. Overall: The location of new Wijn &amp makes for a perfect pre- or post- dinner walk along the Spaarne River. Staff are a little remiss at times, yet generally professional and friendly in giving service. My choice of a Gruner Veltliner may not have been the experts choice to accompany the dishes I ordered, yet proved to be a delicious drop. My partner went for the wine arrangement with three different wines, that he agreed were apt choices to compliment the dishes. Our total bill came to €58.51 (one gratis three course meal + 1 wine arrangement (3 glasses of wine) + 2 glasses of prosecco + 2 glasses of Gruner Veltliner (€5.75each). A lovely evening of wining and dining! Newly opened, The Louisiana Lobster Shack is a very funky looking space. The walls are covered in interesting art works, the bar is fully stocked and ready to meet the desires of cocktail lovers, and the furniture perfectly chosen for the space. Staff members are professional, friendly, cute in their uniforms and obviously experienced at working in a bustling restaurant. The food menu is spread over two pages, with the drinks menu being about three times as long and, for the most part, dedicated to cocktails. For our table of six guests, this should have been the red alert that Louisiana’s main focus is not really the food. Unfortunately for us the hubbub of music, talking and laughter were not conducive to chilling and chatting over expensive cocktails. We started the meal sharing a board of Hush Puppies and New Orleans modified bitterballen. I have always had the belief that deep-frying can make almost anything taste (momentarily) delicious. Incorrect. These deep fried corn meal nuggets were not delicious. Nor were the pseudo bitterballen containing corn meal and unidentifiable bits of meat. Very tasteless and dull. 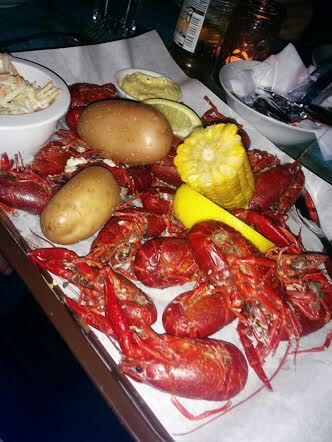 Louisiana Bayou Crawfish Boil (€23.50) – this wooden board covered with red crayfish, two boiled potatoes, half a corn cob, coleslaw and ?spiced butter looked amazing. 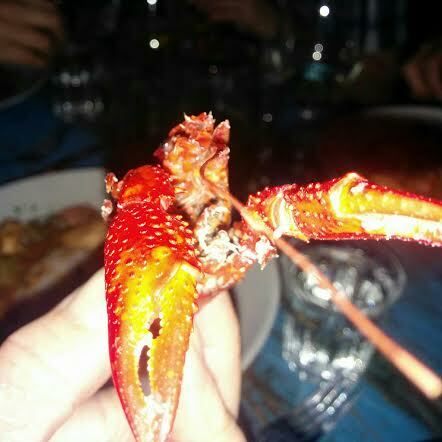 Alas the considerable task of removing the meat from the shells resulted in a tiny mound of tasteless crayfish meat – that couldn’t be improved by adding the ?spiced butter. Gumbo (€14.50) – a traditional Creole dish, but unlike the traditional dish this gumbo lacked the spices that make it favourite comfort food. 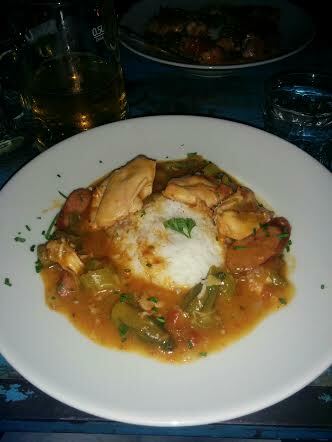 RBR – Red Rice and Beans – (€12.50) as with the gumbo, no taste where there should have been an abundance of spices. Corn Chowder (€9.50) – so dull that only half the serve could be eaten. I had really high hopes for The Louisiana Lobster Shack. 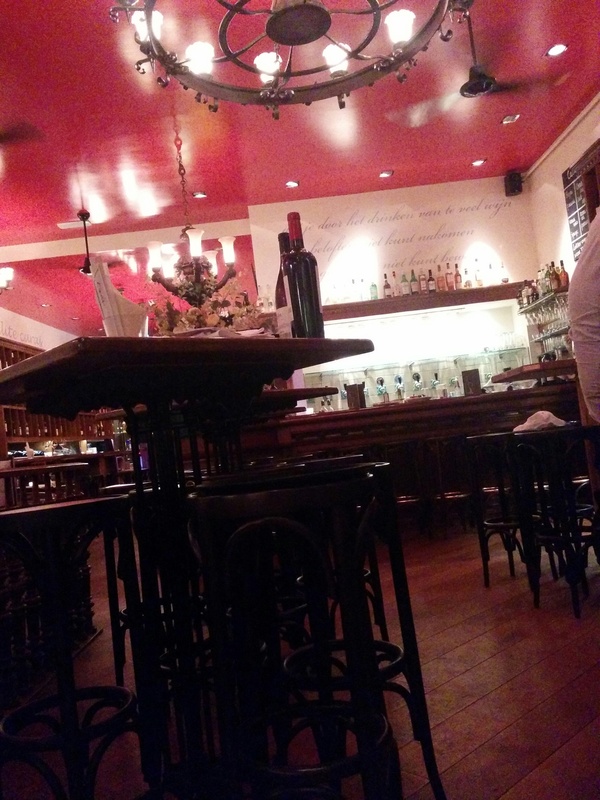 Their concept is fantastic, with Creole food being a perfect addition to the Haarlem restaurant scene. The Louisiana looks great – and will definitely entice the hip and trendy crowd, but offers little to customers seeking a satisfying culinary experience – unless it dares to use the spices intended for Creole dishes. Bill: €165 – for six main meals, two shared entrees, seven beers, two glasses of wine, one prosecco.